Average weekly earnings — N.L. Average weekly earnings — P.E.I. Average weekly earnings — N.S. Average weekly earnings — N.B. Average weekly earnings — Que. Average weekly earnings — Ont. Average weekly earnings — Man. Average weekly earnings — Sask. Average weekly earnings — Alta. Average weekly earnings — B.C. Average weekly earnings — Y.T. Average weekly earnings — N.W.T. Average weekly earnings — Nvt. Average weekly earnings of non-farm payroll employees were $970 in July, little changed from the previous month. Compared with July 2016, earnings were up 1.8%. In general, changes in weekly earnings reflect a number of factors, including wage growth; changes in the composition of employment by industry, occupation and level of job experience; and average hours worked per week. Non-farm payroll employees worked an average of 32.6 hours per week in July, little changed from both the previous month and July 2016. In the 12 months to July, average weekly earnings rose in 6 of the 10 largest industrial sectors, led by accommodation and food services. At the same time, earnings declined in construction, and were little changed in educational services, manufacturing and retail trade. Average weekly earnings in accommodation and food services rose 6.8% to $387, partly due to the fact that earnings were relatively low in July 2016. Earnings in this sector have trended upward since February 2017. The year-over-year earnings growth was spread across most provinces, with the largest increases in Alberta and British Columbia. Among the provinces, British Columbia contributed the most to the national growth. At the national level, the growth was driven by full-service restaurants and limited-service eating places—the largest industry in this sector. In wholesale trade, average weekly earnings were up 5.0% to $1,200, boosted by earnings gains for wholesalers of machinery, equipment and supplies. Most of the year-over-year earnings growth in wholesale trade occurred in the first three months of 2017. Among employees in administrative and support services, average weekly earnings increased 3.8% to $798, largely attributable to increased earnings in employment services. Average earnings in professional, scientific, and technical services rose 2.7% to $1,346. Most of the increase was due to a combination of employment and earnings growth in computer systems design and related services, the highest paying industry within this sector. In health care and social assistance, average weekly earnings grew 2.1% to $882, led by earnings growth for employees working in hospitals. Earnings growth was larger in most of the Eastern provinces, notably Prince Edward Island, Nova Scotia, and Quebec. On the other hand, average weekly earnings in construction fell 2.4% to $1,212, down from a relatively high point in July 2016. The year-over-year earnings decrease was mainly attributable to specialty trade contractors, the same subsector that contributed the most to the earnings growth in July 2016. Among the provinces, Alberta had the largest earnings decline in this sector. In the 12 months to July, average weekly earnings of non-farm payroll employees increased in six provinces, led by British Columbia. At the same time, earnings were little changed in New Brunswick, Alberta, Prince Edward Island and Newfoundland and Labrador. Continuing a long-term upward trend, average weekly earnings in British Columbia grew 3.3% to $941. The largest contributors to this increase were educational services, wholesale trade, and transportation and warehousing. In Manitoba, earnings rose 2.6% to $909 per week. Educational services contributed the most to this increase, along with finance and insurance as well as transportation and warehousing. Average earnings in Quebec increased 2.5% to $897, driven by increases in health care and social assistance as well as professional, scientific, and technical services. 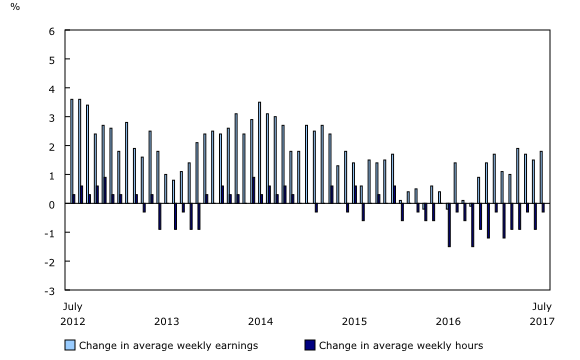 Average weekly earnings in Quebec have been fairly stable since March 2017. In Nova Scotia, average weekly earnings grew 2.1% to $862. The increase was largely driven by gains in health care and social assistance, one of the largest sectors in the province. Average weekly earnings in Saskatchewan were up 1.9% to $1,003. Gains from sectors such as transportation and warehousing were partially offset by losses in finance and insurance. In Ontario, average weekly earnings increased 1.4% to $984. Earnings in Ontario have been relatively stable since the start of 2017. The largest contributor to the increase was a combination of employment and earnings growth in the relatively high-paying professional, scientific, and technical services sector. Wholesale trade also contributed notably to the provincial earnings increase. The number of non-farm payroll jobs was little changed from June to July. However, the number of payroll employees increased in educational services, while the number of payroll jobs declined in accommodation and food services and mining, quarrying, and oil and gas extraction. Compared with July 2016, the number of payroll employees rose by 300,300 (+1.9%). Increases were observed in most sectors, led by educational services (+36,400 or +2.9%), and health care and social assistance (+35,100 or +1.9%). 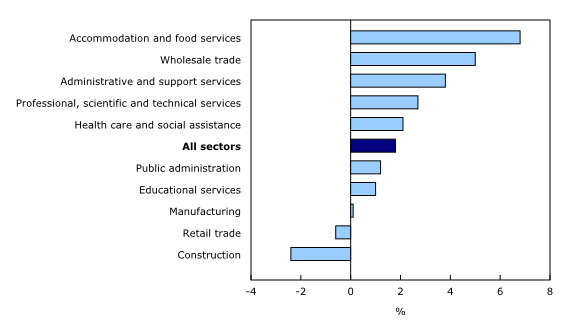 In both of these sectors, employment growth was spread across most of the subsectors/industries. There was also notable employment growth in professional scientific and technical services (+30,500 or +3.5%); retail trade (+29,600 or +1.5%); manufacturing (+28,600 or +1.9%); accommodation and food services (+26,700 or +2.1%); and construction (+24,800 or +2.5%). In the 12 months to July, the pace of employment growth has been similar in both of Statistics Canada's monthly surveys with data on employment: the Survey of Employment, Payrolls and Hours (SEPH) and the Labour Force Survey (LFS). During this period, both surveys showed similar trends in employment for Prince Edward Island, Quebec, Ontario and British Columbia. 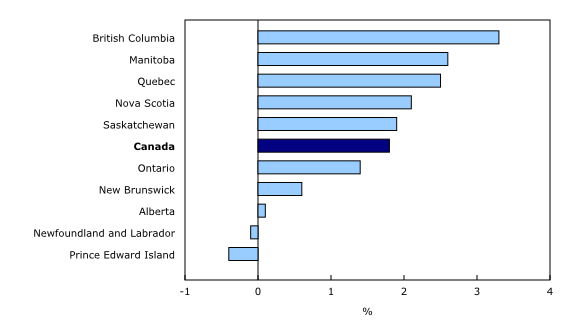 For example, in Quebec, the number of payroll employees in SEPH grew 1.7%, while average weekly earnings were up 2.5%. At the same time, LFS data showed growth in total employment in the province, with the unemployment rate dropping to 5.8%. The professional, scientific and technical services sector includes a wide range of high-skilled jobs in areas such as law, accounting, architecture, engineering, scientific research, and computer systems design. As the nation shifted from a predominantly goods-producing economy to a service-producing economy in the 1950s and 1960s, there was a growing need for highly-skilled professional and technical jobs. From 1950 to 1960, average earnings grew by almost 43%, partly due to a shift of many employees into higher paying professional and technical positions and away from employment in the agricultural sector. By 1983, the 283,000 employees in what is now known as the professional, scientific and technical services sector accounted for 3.1% of payroll employment. The number of payroll jobs in the sector was nearly 420,000 in 1990, declining to 368,000 in 1992 following an economic downturn. This movement represents a drop from 3.7% of total employees to 3.5%. From the mid to late 1990s, employment in the sector grew consistently up to the millennium, reflecting the "rapid growth of the information, communication and technology industry." In 2000, professional, scientific and technical services represented 5.2% of all payroll employees. During the 2008-2009 recession, the proportion of payroll employees in the sector remained relatively stable at 5.2%, unlike in the previous economic downtown. By 2016, the number of employees in the sector rose to 863,000, or 5.4% of all employees. See chart Number and proportion of payroll employees in professional, scientific and technical services, 1983 to 2016, Canada. Sources: "One hundred years of labour force" in Canadian Social Trends (Catalogue number11-008-X) and "Information technology workers" in Perspectives on Labour and Income (Catalogue number75-001-X). On January 1, 2016, the world officially began implementation of the 2030 Agenda for Sustainable Development — the United Nations' transformative plan of action that addresses urgent global challenges over the next 15 years. The plan is based on 17 specific sustainable development goals. The Survey of Employment, Payrolls and Hours (SEPH) is produced by a combination of a census of approximately one million payroll deductions provided by the Canada Revenue Agency, and the Business Payrolls Survey, which collects data from a sample of 15,000 establishments. Federal, provincial and territorial public administration data are collected from various administrative records provided by these levels of government. The key objective of the SEPH is to provide a monthly portrait of the level of earnings and the number of jobs and hours worked by detailed industry at the national, provincial and territorial level. Estimates of average weekly earnings and hours worked are based on a sample and are therefore subject to sampling variability. This analysis focuses on differences between estimates that are statistically significant at the 68% confidence level. Payroll employment estimates are based on a census of administrative data and are not subject to sampling variability. Statistics Canada also produces employment estimates from its Labour Force Survey (LFS). The LFS is a monthly household survey, the main objective of which is to divide the working-age population into three mutually exclusive groups: the employed (including the self-employed), the unemployed, and those not in the labour force. This survey is the official source for the unemployment rate, and collects data on the socio-demographic characteristics of all those in the labour market. As a result of conceptual and methodological differences, estimates of changes from SEPH and LFS do differ from time to time. However, the trends in the data are quite similar. To better understand the conceptual differences between employment measures from the LFS and SEPH, refer to section 8 of the Guide to the Survey of Employment, Payrolls and Hours (Catalogue number72-203-G). Unless otherwise stated, this release presents seasonally adjusted data, which facilitate comparisons by removing the effects of seasonal variations. For more information on seasonal adjustment, see Seasonally adjusted data – Frequently asked questions. Non-farm payroll employment data are for all hourly and salaried employees, as well as for the "other employees" category, which includes piece-rate and commission-only employees. Unless otherwise specified, average weekly hours data are for hourly and salaried employees only and exclude businesses that could not be classified to a North American Industry Classification System (NAICS) code. All earnings data include overtime pay and exclude businesses that could not be classified to a NAICS code. Earnings data are based on gross taxable payroll before source deductions. Average weekly earnings are derived by dividing total weekly earnings by the number of employees. With each release, data for the current reference month are subject to revision. Data have been revised for the previous month. Users are encouraged to request and use the most up-to-date data for each month. Real-time CANSIM tables 281-8023, 281-8026, 281-8047 and 281-8063 will be updated on October 10. For more information, consult the document Real-time CANSIM tables. Data on payroll employment, earnings and hours for August will be released on October 26. A summary table is also available. Job Vacancy Statistics (5202) from the Survey of Employment, Payrolls and Hours for June are now available in CANSIM. More information about the concepts and use of the Survey of Employment, Payrolls and Hours and Job Vacancy Statistics is available in the Guide to the Survey of Employment, Payrolls and Hours (Catalogue number72-203-G). To enquire about the concepts, methods or data quality of this release, contact Gordon Song (613-793-2392; gordon.song@canada) or Client Services (toll-free: 1-866-873-8788; statcan.labour-travail.statcan@canada.ca), Labour Statistics Division.